Here's a summary of Richard Cohen's latest column: Karl Rove was kind of wrong to imply that Hillary Clinton might have health issues, but hmmm... hmmm... now that you mention it, how much DO we know about Hillary these days? Is she being kind of secretive? Hmmm. And, thus, Cohen flawlessly delivers exactly, precisely the reaction Karl Rove was hoping to spread. It's breathtaking just how easily he wanders into the trap. Not sure if you are a Dr. Who fan but, perhaps Rove watch the "Don't you think she looks tired" episode and thought it was a good idea to try. Oh, Principessa! 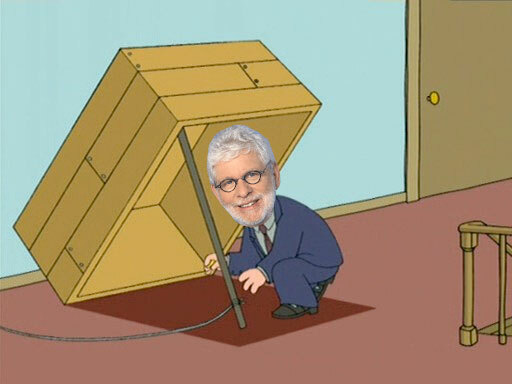 Now you will have to modify your cartoon of Richard Cohen. His hair must be canary yellow.